Print pattern and enlarge to appropriate size for your canvas. You will probably have to break the pattern into sections to get it large enough. Paint the entire canvas with White paint. Use transfer paper to trace the pattern onto your canvas, or if you are comfortable with it, free hand the design on lightly with a pencil. Paint the trunk and branches first use Ebony paint and a liner brush. Fill the thick areas in using angle brush. For larger shamrocks, use round brush or liner brush. Creating shamrocks is simple connecting three heart shapes at their points, with their sides touching each other. This leaves an open area at the bottom for the stem. Paint the small shamrocks onto the thin branches first using Leaf Green. Next add large Leaf Green shamrocks around the outside of the tree. Use Light Hauser Green to paint more large shamrocks around the outside of the tree. Fill in the rest of the shamrocks in different sizes and colors using Golden Straw, Primary Yellow and Golden Straw. Use the handle end of your paintbrush to add different colored dots in various places around the tree. 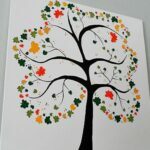 This project for Shamrock Tree on Canvas was printed from CraftsbyAmanda.com - https://craftsbyamanda.com/shamrock-crafts-shamrock-tree-on-canvas/ and can only be printed for education or personal use.